Batting: Powell 88 off 127 balls, Holder 39 off 40 balls. Bowling: Kumara 3/40 in 9 overs, Herath 2/52 in 24 overs, Lakmal 1/32 in 12 overs. Batting: Kusal Mendis 94* off 186 balls, Angelo Matthews 31 off 80 balls. Bowling: Bishoo 1/32 in 10 overs, Gabriel 1/44 in 10 overs, Holder 1/18 in 10 overs. Sun came out on Day 4 of this test; A good sign for batsmen. But, the pitch from one end was starting to open up which would definitely favour the bowling side. WI were in the lead by 360 runs and 6 wickets in hand. Dowrich and Powell came on to bat and their strategy was quite clear – Put runs on the board, score a massive lead and then bowl out Sri Lanka and win the test. But, they weren’t really attacking the Sri Lankan bowlers. This allowed Sri Lanka to attack and the leading wicket taker in this test, Kumara pinned Dowrich on the pads to claim his 3rd wicket. 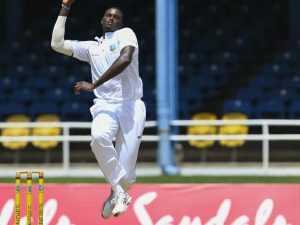 The Windies captain Jason Holder joined Powell. Both batsmen batted beautifully and took the lead over 400 runs. Drinks were called. And, right after that aggression began to emerge in WI innings. As, Holder started hitting boundaries in an effort to extend the lead in as little time as possible. Powell was batting on 88 runs and his plan to tire Sri Lanka out was working. However, he didn’t hold out for long as he fell to Perera after he failed to execute a flick shot. Holder was now joined by Bishoo. At this point WI were leading by 427 runs with Holder playing with a strike rate of nearly a 100. WI should have declared at this point and cricket fans shared the same opinion. But, Holder wanted to go on and his over-aggression cost him. As, after sharing a stand of 12 runs with Bishoo, Holder was pinned lbw by Herath. Kemar Roach joined Bishoo. At this point, instead of going all out and score runs in minimal time, both batsmen slowed down. Runs weren’t being scored at a swift rate and this forced Jason Holder’s hand as he declared WI innings. 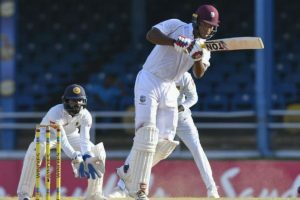 The reaction of cricket fans were justified as they had seen West Indies declare twice in a test match after a very long time. Can’t remember the last time I saw West Indies declare twice in a test match. Raatid! The last time west indies declare inna one test match….one busta cost 30 dollar!! Sri Lanka now needed to bat a full and a half day to save this test or score 453 runs to win it. Sri Lankan openers Mendis and Perera came out to bat in the 2nd innings. Both players, especially Perera started out aggressively. But this approach of his, got him out in the very next over. Gabriel was the man to provide the breakthrough and WI were now 9 wickets away from victory. After a bad start, WI bowlers finally found their length. 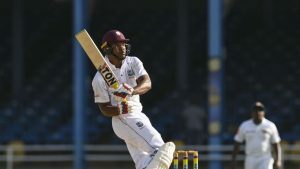 As, Mendis and the new batsman Chandimal were clearly struggling against WI pacers. Nevertheless, Chandimal was starting to set in but could not cope with the weather and returned to the pavilion, status: retired hurt. Chandimal has retired hurt just now! So can he come back to bat again at any spot or he has to come after the fall of the 9th wicket only? Angelo Matthews now joined Mendis. Both batsmen started to retaliate and build a solid partnership between them. And, for the first time in this match it looked like the resurgent West Indies were fading. The partnership was now worth 74 runs and Mendis had reached his fifty, fully supported by Matthews from the other end. West Indies Vs Sri Lanka 1st Test just came alive again. West Indies needed a wicket at this point. And, it was provided to them by Holder who took out Matthews and Sri Lanka were 2 wickets down for 123 runs. Mendis was now joined by Silva. Both batsmen shared a 52-run partnership and the total was now under 300 runs. Things were looking dangerous for West Indies. At this point, Silva needed to support Mendis but he gave his wicket to Bishoo who took a catch off his own bowling. Gamage came in as the nightwatchman and managed to survive the last over of the day. The highlight for Sri Lanka was Kusal Mendis who is still unbeaten on 94* runs. Sri Lanka ended the day with 7 wickets in hand and require 277 runs to win this test. 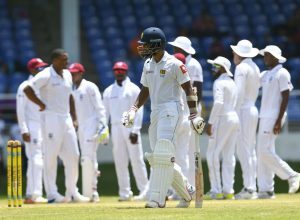 It was fighting day of test cricket of West Indies Vs Sri Lanka as both sides will now move onto Day 5. Join Allsportspk tomorrow for Day 5 of West Indies Vs Sri Lanka 1st Test.